Too many artists are building someone else’s business. 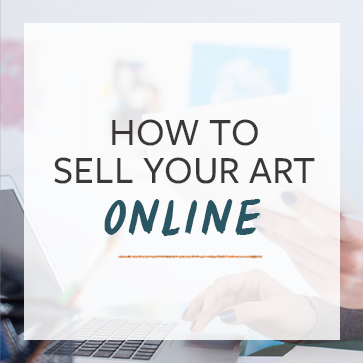 Sites like Etsy, Artfire, FineArtAmerica, and others (which I call Art Malls) make it easy to create the illusion of having a ‘web presence.’ When they upload all of their work to an Art Mall site, it makes many artists feel like they are finally getting their work online. All you’re really doing is creating more content for these sites to sell, with no investment on their part. You could be doing the same thing for yourself. You are an artist, not a commodity. No getting lost in the crowd. If you are on one of these online art malls, you are one artist among thousands. Browsers will click right by all of your stuff because someone more interesting is right next to them. Even if you get featured as an artist of the day and have a few thousand people look at you, that attention is gone within a couple of days. You can build your fan base. When you are on someone else’s website, you had better believe that they are benefiting more than you are. When they share a page with a friend on Facebook, that links back to someone else’s website. When they sign up for an email list, that list is owned by someone else, not you. With a little bit of work or a small investment of cash, you can build a site where people play directly with you, not with others. For example, some customer support software allows you to interact in real time with visitors to your site, an excellent relationship building and sales tool you won’t get as part of an Art Mall. You get your own domain name. If your website is something like www.YourName.TemplateCompany.com then you are leaving a lot of opportunities on the table. A real domain name (www.YourName.com) costs about $8 – $10. There’s no reason to not have a custom URL. In addition to it looking more professional, you will do better in the search engines. Control over your look and feel. If you are a dark and brooding artist, why are you displaying your work on a site with cheerful, happy arts and crafts? You know that people’s reactions to art is all about context. They need to see your work in a context that makes sense. In online mall sites, you get a limited set of looks, with a very limited ability to change them. Last week I had a client email me because her artist website was a mess. The company that she was with had made some changes to their websites and she didn’t like the changes that were made. In addition, the company was keeping her mailing list hostage – she couldn’t export her mailing list if she switched websites. If you’re using a template then your site looks like hundreds or thousands of other websites. People expect artists to value creativity and originality. Your site should differentiate you enough to make you stand out. Also, most artist website templates already look like they were designed in 2000 with no updates since. Non-flexible features. Even if the company just launched and they have every bell and whistle in their current templates, the Internet changes fast and you need to be able to adopt new technologies into your site as they come along. Most artist website companies shoehorn new features into their sites in ways that are awkward and unwieldy. Also, some artist website companies try to be all things for their artists and they end up not doing anything very well. It makes you look cheap. If you are selling $2000 original pieces of art, why do you have a website that looks like it cost $30? Your image has to match your market. Since most collectors are wealthy and educated, they are probably going to expect something a little more sophisticated. No access to the html of your site. In order to make real customizations to your website, you need access to the html files. If you don’t have access, you can’t change borders, colors, sizes, and where page elements are placed. In addition, if you ever decide you want to move your website to another hosting provider or another company, you’ll have to start over from scratch. Search Engine Friendliness. This is a tough one for most web designers. Quite often, if they are good at making pretty designs, they’re not too good with making sure the search engines find your site. If you want to be found online, then you need to make sure that your site can easily be optimized for search. How Do I Get A Good Artist Website? I’d recommend hiring a professional website designer. If you can’t spend the kind of money that it takes to have a really great website built for you, then I highly recommend WordPress as a way to get a high-quality website up and running. WordPress is a free website building software that can have a site up and running in literally minutes. If you want to see how I set up an artist’s website in less than 10 minutes using WordPress, check out How to Build an Artist Website in 10 Minutes with WordPress. I also recommend checking out our review of Shopify and Squarespace. This post hit the nail on the head. I think the problem is that most people think building their own website is beyond their skill-set so they go with the “easy” (but not always best) option. I admit, I was way scared to figure it all out but knowing what I know now, you just need a host such as Bluehost, then you need to search for a domain preferably with valuable keywords in them Godaddy Bulk Domain Lookup, then you can install a simple WordPress site where you literally fill in basic info, wait a few minutes, and it’s installed. I wrote a post about it here on Artists.me. The reason Artists should probably go with WordPress is that it’s easy, and speaks to your point of “Search Engine Friendliness.” Artists can download the “All in one SEO pack” and make their site fully optimized with page titles, descriptions, keywords and everything else search engines need to find and rank their site. Good stuff The Abundant Artist! Thank you for this post. I found it to be very helpful, as I am an artist, looking to build my own eCommerce website! I added your article to my blog review. I hope you get new French readers. You’ve made this point before, Cory, and I do find it compelling. I have both my own website at lisafirke.com and an etsy shop at LisaFirke.etsy.com. The Etsy shop has only been live since mid-September, and I’ve made 18 sales in that time. I have no idea idea how that would stack up against having sold directly from my own site. My reason for choosing Etsy was that it would attract more like-minded shoppers. If they like so-and-so’s work, they might also like mine, etc. What I’m finding is that this is somewhat true, but it’s also true that I’ve had to train my buyers to find me twice–once at my own site and again at Etsy. @lisafirke Lisa, I’d love to do some split testing with you and publish the results. @CoryHuff How would that work, exactly? I’m launching some new facets of my site in January, and I think I’ve just put a shop in the lineup. PS: I think the range you quote for professional web design is on the low side. Yes, you can find those prices, but you’ll get better work if you think of it as more like $2500-$7500. Which, I know, sounds enormous. It’s difficult for designers to serve the artist’s-site niche, since these are people who deserve and should have topflight design, but rarely have the budget. I’ve made it my business to serve artists and writers, but I’m discounting my work heavily to do so (even at the higher range quoted above). What can come in the $500 to $2000 range is custom graphic elements and style sheet advice on how to make that WordPress site look like a pro hand touched it. Thanks for this useful article. I have not had much success selling my screenprints on Etsy (http://www.etsy.com/shop/VisionsInPrint). Although it’s a fun place to be, it generally caters to a lower-end, more craft-oriented market and it’s difficult to stand out there as a fine artist. I have had a few sales on a site which makes products from my artwork, but the commission is 90% (!) because they handle the production, sales and shipping. Sites like those are obviously not favorable to the artist but they do provide additional exposure as well as connections to other creative people. I agree that it’s much better to sell your work from your own site and, as a web designer in training, I am currently working on my own site in WordPress. For those of you thinking about creating a WP site for your art, I would encourage you, but I would like to dispel the myth that you can make one in ten minutes. Realistically, I would allow one full day, which would cover getting a host, registering a domain name, uploading your images (assuming you have a digital copies already) as well as inserting content into your site. If that’s too much of a time investment, I would recommend hiring a designer to help. I’d also like to add that Lisa F. is correct about the appropriate cost of web design. @ClareWinslow Clare, if course you’re not going to have the site finished in 10 minutes, or an hour, but you can have something up fairly quickly, and then the rest you can add at your own pace. Good points Cory, it’s definitely important to have your own website, but I think the ‘Art Malls’ can work well alongside your own website, for selling prints etc. without the hassle of taking payments and organizing shipping. @rightbrainrockstar They can work along side what you already have, but I would discourage any artist from using them as a main distribution point. The majority of your engagement and sales should come from your own site. This is the best strategy for long term growth. Thanks so much for this article, as I’ve always avoided using sites like etsy to promote my work for the very reason that I am looking for higher end buyers and collectors and don’t want them to think that they could buy my work on etsy or ebay. I’m a younger artist and have only “launched” my career in the last 2 years, or been painting and selling my work full-time without doing anything else. I would like to ask you if you would be willing to write a follow up article about ideas and ways to attract higher end clients and collectors. I have a few higher end clients, but right now I’m encoutnering a lot of middle to lower end buyers that do not want to spend more than say $300-$400 on a painting. I have sold several smaller paintings in group gallery shows this year, but have been rejected from all the galleries I’ve applied to this year, so no opportunity for a more important show (yet). Any input would be greatly appreciated. @KellyMedford Hi Kelly! I think writing a post on attracting high end buyers is a great idea. I’ll put it on my list. 😉 Thanks for commenting! @CoryHuff@KellyMedford Thank you Cory. I really enjoy reading your newsletter and find it extremely helpful. I’m looking forward to hearing your thoughts on attracting high end clients. Thanks fo your response. Reading this before I head off to work. Even then I am promoting another business (large retail) ontop of etsy and bigcartel!! I had one of those easy portfolio sites for a while. At first it was shiny and new and I paid $10 dollars a month. Then I realized how ugly it really was. lol. I have yet to find a wordpress template I really like for a portfolio. Its really hard to find something as minimal as I want and still look fresh. Currently I moved maybe 20 images onto a page on my blog as a temp. portfolio but lets not even begin to discuss that eye sore…Not to mention I left out my best work in it. Would you recommend having an artists portfolio on the same site as their blog? Or have a link to a entirely separate website? Another thing I do is post more than just my artwork on the blog. I do not post other peoples artwork even if I find it amazing. Because the whole point is to sell mine. However I do have ad links for some of those places. Cory, Admittedly I am biased since I run a business, http://www.artfulhome.com, which markets the work of artists, but it seems to be that there is one important component that you are missing, and that is the marketing side. No matter how beautiful and terrific a site is, what is necessary is to attract potential buyers to it. We invest millions in marketing, and thus are able to reach a much wider audience than many artists can reach on their own. While we might not work for everyone, we do make it possible for many artists to make their living from their art – and expose their work nationally to thousands and thousands of potential buyers. @LisaBayne Hi Lisa. Thanks for commenting. I think I understand what you’re talking about here – and if your company spends time and resources on marketing an artist and helping them build their personal brand as well as yours, then that’s great. How would you recommend an artist stand out in a crowded marketplace in a site like yours? @CoryHuff@LisaBayne One of the best and most proven ways for an artist to stand out on our site is to post new work on the site with some frequency. The “What’s New” link is one of the most trafficked parts of the site, and customers return here frequently. It’s much better to sell your own work from your own site and, as a web designer in training; I am presently running on my own site in WordPress. I am the Artist Development Manager for Artwork Network http://www.artworknetwork.com and there isa truth to this article that can’t be denied. I am an artist and photographer and I have used “art malls” in the past with little to no result. What I like about Artwork Network is it is not an “art mall”, the service and one on one attention given to the artist is outstanding (few art marketing companies, let alone art malls actually call each artist and lay out a plan of action in order to increase sales), and the jurying process ensures a good fit for it’s global target market! You can still have your own site and Artwork Network markets that, too. It’s a unique model that works! I Cory. First of all, thanks for all the useful info you post. I designed my website with Dreamweaver and now I am trying to switch to WordPress due to its flexibility. My main concern to sale online and to promote my work is how to deal with shipment cost. I live in Chile, South America and I recently sent a painting to an exhibition in London and had to afford an airfreight of US$ 150 and it was a medium sized image that weighted only 3 kgs. Cory, Thanks for all your information. I have designed my own artist’s website on faso.com (fineartstudioonline) over a year ago. Feeling like a dinosaur with everything technical from websites, the internet, online stuff, it gave me moments of both satisfaction and frustration! I have been able to work on my site for a fairly cheap monthly cost as opposed to selling out alot of money to someone else, plus I can add/delte change things whenever, and I learned alot! I think about changing, but for now it works. Your info on WordPress has me intrigued. I have had major problems getting people to sign up for my mailing list. I recently just opened an etsy shop, thinking I might have some sales, especially my giclees. I researched the other artists, mainly acrylic painters and what was selling at what price point. I feel I am after a different market, as my originals do sell in my galleries for a bit higher price point, thus the giclee sales is what I’m hoping to sell. Do you think being on etsy can actually hurt me? Do you design template and sell them.? can you share me your website. I agree. It’s sad to see talented artists using another person’s website as their creative hub. Aside from looking unprofessional, the artist also becomes dependent on the website owner and his decision to keep the site alive. Moreover, a lot of art/portfolio sites actually make your artwork look really bad (blurry, darker, smaller, or a combination of all three). I recently started blogging on blogger.com, but should I change to WordPress? I have made 20 posts and have had 500 visits, but no comments or followers as of yet. Should I invest in a paid site while things are still getting started? If you’re thinking of running a business, then I would suggest you move to something you control at some point. You can always import your blogger posts to your new site later, but the longer you go, the harder it will be and the more people you will lose in the transition. Hi Cory, About seven years ago I decided to sell exclusively from my own website, and that’s gone fairly well. I recently interviewed an artist that shows about 10 artists in an online gallery. The artist who runs the website said sales are good, but he indicated that sales probably wouldn’t happen without advertising. I do plan on placing ads on Facebook and Instagram in the coming year to get more subscribers for my email newsletter. While art malls might spend thousands on advertising, I can spend a modest amount and get folks to my own domain where they see only my work. I want them to follow me away from the crowd. I bought and read your book and started implementing many of the suggestions on my own art site ‘http://en.sedas.be’ ( with a lot more sitting in the pipeline like ecommerce integration ). WordPress and alike ‘content management systems’ (CMS) should be your starting point to provide a good basis to allow easy management of the content but will still require quite some customizing to make it your own unique style. I use Weebly to host my website and found it pretty easy to use and change around. I recently upgraded to the unlimited web commerce feature to see how it works for me. Now I’m trying to figure out how to get people to my site and making purchases. It is a lot of work, but I think it is necessary. Any feedback would be appreciated http://www.beckyroeslerart.com. These days WordPress is the chosen platform for many of those professionally designed/developed websites. WooCommerce+WordPress is about the fastest cheapest way to get your own shop up and running with all the control. It also means all the responsibilities are one you. I will say this about Etsy…they invest money in Google Shopping listings that I don’t pay for, that brings in traffic and sales. They also have such a traffic volume that products get indexed in search engines there much faster than they will on one’s own. This is all to say that self-hosting isn’t a “short game”.